Panna Cotta is a classic Italian dessert which means cooked cream. It is velvety smooth and decadent and has a very close resemblance to the Indian Phirni or the Arabic Mahlabi. While Phirni uses rice flour and Mahlabi uses cornstarch to thicken boiled milk, Panna Cotta uses gelatin to a mixture of boiled milk and cream. And then there are also differences in the flavouring agents used and the way these desserts are served. I am hoping to post recipes for Phirni and Mahlabi very soon; so more later. The recipe here is a change to the traditional one since it uses white chocolate (source: Woolworth's Australian Good Taste magazine). The original recipe serves Panna Cotta with coffee syrup but here I have used orange marmalade sauce (source: http://www.eatingwell.com/recipes/orange_marmalade_sauce.html). The first time I made this, the sauce turned out more bitter, since the marmalade I bought was more on the bitter side. The next time I tried it with a different brand of marmalade which was more sweet and the sauce turned out better. You can also serve it up with a berry coulis or a berry sauce. The choice is yours. The challenge here is to unmould the dessert from ramekins which I found was much tougher than it sounded. The easy way out will be to set panna cotta in the serving bowl itself and pour the marmalade sauce over it before serving. 1. Place cream. chocolate, milk and caster sugar in a saucepan over low heat. Cook stirring for 3-4 minutes or until chocolate melts and the mixture is smooth. Take boiling water in a bowl, sprinkle with gelatin and whisk with a fork to remove lumps. Set aside till gelatin dissolves (around 3 minutes). Add dissolved gelatin to cream mixture and whisk to combine. Pour equally among 8 ramekins. Cover with plastic wrap and keep in refrigerator for at least 6 hours to set. 2. Bring orange juice to boil in a medium saucepan. Reduce heat to medium and let it simmer until reduced by half (around 30 minutes). Add marmalade and brown sugar and whisk until smooth. Mix cornflour to water until smooth and add to orange juice mixture, whisking continuously and boil for about 1 minute, till the sauce thickens. Remove from heat and add vanilla extract and butter and stir well. Keep aside to cool slightly. The sauce should be warm when serving. 3. To serve, dip ramekins into hot water for a few seconds, one at a time, and turn them onto serving plates. 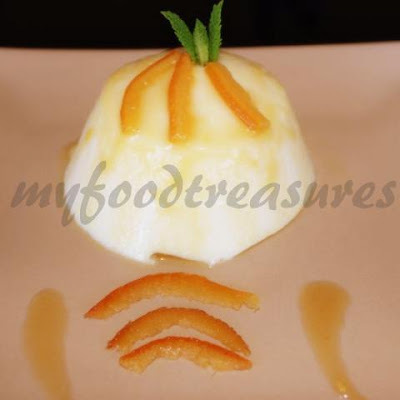 Pour warm marmalade sauce over panna cotta and serve.